In organic terms the Regulatory Council is considered a local representative Administrative body according to Law 25/1970 of December 2nd “Statute on Vineyards, Wine and Alcohols”. The Regulatory Council is a collegiate body dependent on the Department of Agriculture of the Regional Government of Aragon and has the status of a local representative body with decision-making powers in whatever functions are granted it in this Regulation, in accordance with what is determined by the current legislation. In functional terms, the Regulatory Council is the control and certification body contemplated in Regulation (EEC) 2081/92 and in the Order of the Ministry of Agriculture, Fisheries and Food of January 25th 1994 by which the correlation between Spanish legislation and the aforementioned European Regulation is specified. The main purpose of the Regulatory Council is to apply the precepts of this Regulation and ensure that they are observed; for this purpose, it shall perform, with the adaptations required by the extension of the system of designations of Origin to other agrifood products, the functions granted it in article 87 of Law 25/1970 and additional provisions, together with those that are expressly indicated in the articles of this Regulation. The Regulatory Council will verify that the rules established are being observed and certify the conformity of “Aceite del Bajo Aragón”, pursuant to standard EN 45.011 to which article 10 of Regulation (EEC) 2081/92 refers. As an administrative body it is subject to Law 30/1992 of November 27th, “Law Governing the Public Administrations and Common Administrative Procedures”, whose chapter II indicates that Regulatory Councils are collegiate bodies. The penalty system for non-compliance of this Regulation will be the system established by Law 25/1970 of December 2nd, “Statute on Vineyards, Wine and Alcohols”; Decree 835/1972 of March 23rd, which approves its Regulation; Law 20/1984 of July 19th, a general law for the defence of consumers and users; and Law 30/1992 of November 26th, on the legal system of the Public Administrations and Common Administrative Procedures. The basis for imposing fines will be determined in accordance with what is set forth in article 121 of Decree 835/1972. For the application of the penalties contemplated in this Regulation the rules established in article 121 of Decree 835/1972 shall be taken into account. 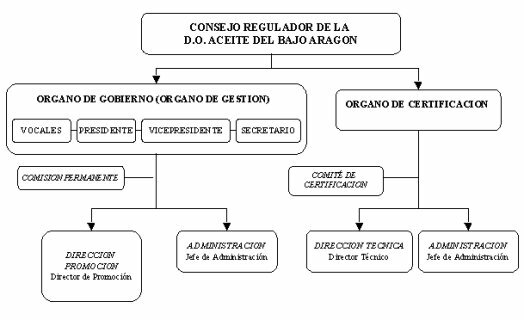 Download Regulation of the Designation of Origin "Aceite del Bajo Aragón"
An organisation chart showing the names of those occupying the various offices is contained in FR-B3-01. The operation, structure and composition of the Governing Body, together with the functions and responsibilities, both of the Body itself and of its Chairperson, Vice Chairperson and Secretary are described in detail in the Regulation of the Designation of Origin “Aceite del Bajo Aragón”. To carry out control of the production, processing and packaging of “Aceite del Bajo Aragón”. To ensure and guarantee optimum Quality of the certified product, ensuring continuous improvement both in the process and in the final product. To identify the Certification Committee. To keep the Registers of the farming estates and processing and packaging industries registered in the Designation. To manage the economic resources. To collaborate in Training tasks in the sector and in the training of personnel run by the Regulatory Council to guarantee continuous improvement. To define and document the Quality Policy, including the Quality objectives its commitment to Quality. To ensure that the Quality Policy is understood, implemented and maintained at all levels of the organization. Ensure that the QS is established, implemented and maintained pursuant to standard UNE-EN 45011. Inform the Council of the working of the Certification Body. Is in charge of the day-to-day management of the activities of the Certification body and of guaranteeing impartiality; his or her certification-related decisions are supervised by the Certification Committee. To execute the decisions adopted by the C.R.D.O. Governing Body and inform this body and the Certification Committee of the activities and steps taken with regard to certification. To ensure that both the initial and follow-up assessment activities pertaining to certification are carried out appropriately. To deal with any certification applications received and initiate the relevant processes, allocating the resources and materials required for this purpose. To select and verify the competence of the subcontracted bodies that participate in the assessment and testing activities. To bring before the Plenary Session of the Governing Body proposals for initiation of disciplinary action with respect to supposed irregularities detected in the course of the assessment process. To draft and constantly update the Regulatory Council Quality Manual and the entire set of Quality System documents. To manage the processing of non conformities and corrective actions. To plan, coordinate and carry out internal Quality audits. To participate in decision making on the Quality policy and objectives. To follow up on claims, appeals and disputes. Telephone service , reception and classification of correspondence. Reception of Registers of certification of conformity. Keeping of lists of charges and stocks. Preparation of relevant documents for each Council session or Certification Committee meeting. Relations with management service companies. Receipt of the information provided by the different bodies. Ensuring the confidentiality of the data, by signing the Declaration of Confidentiality and Independence, FR-B3-03.